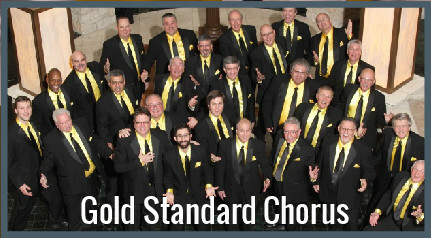 Join the best men’s a cappella ensemble in the Charlotte Metro area. No need to wait for “Audition Night”, you’re welcome to join us at almost any Monday evening rehearsal. Visit us Monday nights at 7:30pm in the Fellowship Hall in the Hall Community Center on the Aldersgate campus, 3800 Shamrock Drive, in Charlotte. From US-74/Independence Blvd., exit at Eastway/Wendover. Take Eastway. Drive about 2 miles. Turn right at the third stop light which is Shamrock Drive. The first stoplight on Shamrock will be Willard Farrow Drive, which is the entrance to the Aldersgate campus. Tell the guard you are visiting the Barbershoppers meeting in the Fellowship Hall. As you continue on Willard Farrow, you will come to a small traffic circle. Turn right. Turn left on Cole Drive, and park anywhere along this strip. You will see a portico for the Hall Community Center. The door is locked, but you can push the button on the security speaker and ask to be let in as part of the Barbershoppers. Once inside, take the hallway to the left to find the Fellowship Center on your right. Alternatively, you can enter thru the lobby of the tall apartment building further to the left. Once inside this lobby, head to the back right corner and take the hallway to the Fellowship Center. Need something else? – use our Contact Us page.